435. 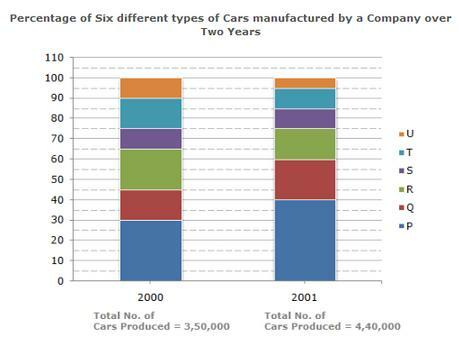 What was the difference in the number of Q type cars produced in 2000 and that produced in 2001? 436. Total number of cars of models P, Q and T manufactured in 2000 is? 437. If the percentage production of P type cars in 2001 was the same as that in 2000, then the number of P type cars produced in 2001 would have been? 438. If 85% of the S type cars produced in each year were sold by the company, how many S type cars remain unsold? 439. For which model the percentage rise/fall in production from 2000 to 2001 was minimum?